When making most bread recipes, kneading the dough is a crucial step that cannot be skipped. Kneading means to work the dough, usually by hand, for the purpose of developing the glutens in the flour, which is what gives baked goods their structure and texture. When making dough, the flour and other dry ingredients are combined with the wet ingredients—usually warm water, along with yeast and sugar—until a sticky mass forms. This sticky mass is then kneaded until it forms a smooth ball with an elastic texture. After kneading, the dough is left to rise and then baked. The process of kneading the dough helps to evenly distribute the ingredients and incorporate air, which assists in making the bread light (versus dense) and contributes to the overall texture of the loaf, both inside and out. 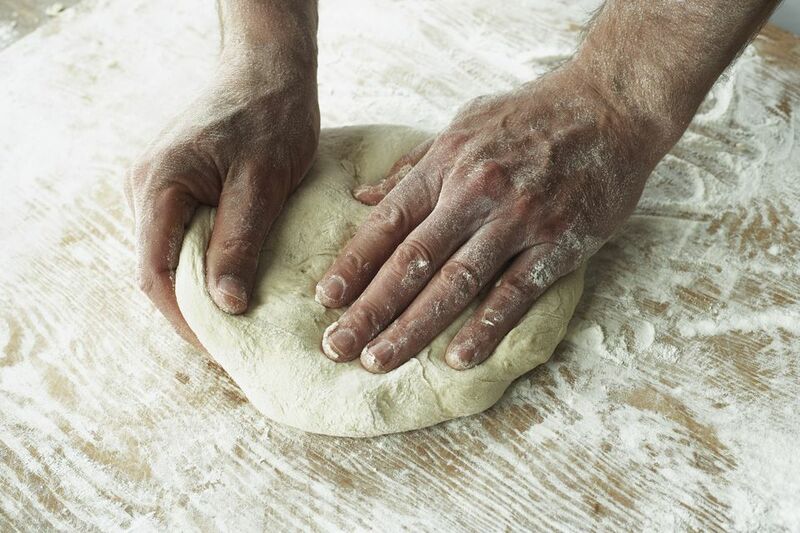 Most importantly, the act of kneading develops gluten, which is necessary for the bread to expand without bursting. Wheat flour contains two proteins that come together to form gluten; simple mixing leaves these proteins in a random order, but kneading the dough organizes the proteins and links them together creating gluten. This allows the bread to form a stable structure with a tender interior and crusty exterior. The usual technique for kneading involves placing the ball of dough on a flat, lightly floured surface and pressing it with the heel of the hand in a sort of forward rolling motion, then rotating the dough and repeating. The dough is both squeezed and stretched; it is this squeezing and stretching that develops the gluten molecules. It helps to lightly flour both your work surface and your hands to prevent the dough from sticking. Bread dough usually needs to be kneaded for 8 to 10 minutes. Too little kneading will produce a bread that's too dense, and too much kneading will make the finished bread too hard. Although the word kneading is generally only used to refer to the act of working the dough by hand, the process can also be accomplished by a machine, either using the dough hook attachment on a stand mixer, or in a food processor. You will have to do a final knead by hand after removing the dough from the mixer or processor. Once you feel comfortable with the technique of kneading, you need to master how long you should knead the dough. It is important that the dough is kneaded for the right amount of time or the bread will either turn out flat and dense or rock hard and dry. The good news is that these negative results mainly occur when the kneading deficit or surplus is at an extreme; in other words, you will have to really under- or over-knead to not have a successful loaf of bread. If you think you have kneaded enough but the dough is limp and loose and won't hold shape, these are signs you need to knead a bit more. The dough should also not be shaggy or tear easily; continue to knead until the dough is smooth and holds together. If you are kneading by hand, it may be difficult to over-knead as the continuous action will tire you out before you get too far gone. If you are kneading my machine, however, over-kneading is a greater possibility. Once you remove the dough from the mixer for the final knead by hand, if the dough feels tough and dense, is difficult to fold over itself, and tears easily, it has been kneaded too much. There is not much to do to remedy the situation, but you can leave the dough to rest for 15 minutes to help it relax a bit. What Does It Mean to Steep Something?